Calling Bell malayalam movie directed by Kollam Ajith is gearing up for release. Ajith who had been a part of the malayalam film industry as actor for more than three decades would be helming the project titled 'Calling Bell'. Devan, Kochupreman, Manikuttan, Kalabhavan Shajon, Vrinda, Lakshmi Menon, Salu Kurian and Santhakumari would be seen in prominent roles in the movie. Dileep Raman stayed behind the camera as cinematographer. Kollam Ajith who had been keeping his presence alive in the malayalam film industry for the past three decades is trying his luck in direction too. After being a part of more than 500 movies in 3 languages, the lovable villain is making his directorial debut with 'Calling Bell' which pools into contemporary issues creamed with strong message for the society. The story of the movie revolves around the life of Qasim Bhai (Kollam Ajith), a thief who breaks open a locker of a private bank and flees after taking the money. As the alarms get triggered, the police give a chase to Qasim Bhai who runs away. He runs into a building which has several apartments. He finally gets into the bathroom where he finds the tap open and water dripping. Suddenly a message appears on the screen. 'Some people are dying because of a lack of one drop of water. Water is precious. Do not waste it.' The movie is all about a good thief who who steals from banks, and helps the poor. Similar scenes with messages are placed in various situations which include subjects like the wastage of electricity, the dangers of alcohol and smoking, and the evils of dowry and casteism. Ajith had been nourishing the dream to become a film maker after getting tips from directors like Padmarajan, Sathyan Anthikad and Kamal. Ajith who took six months to script the movie has also produced it along with his friend Rinoi Rajan under the banner of Rans Entertainers. 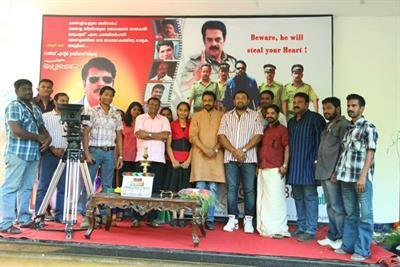 Devan, Kochupreman, Manikuttan, Kalabhavan Shajon, Vrinda, Lakshmi Menon, Salu Kurian and Santhakumari would be seen in prominent roles in the movie. Dileep Raman stayed behind the camera as cinematographer. For the lyrics of Chunakkara Raman Kutty, veteran music director M K Arjunan has set the tunes. Ajith who has got deeply influenced by Padmarajan wishes to follow his path too. Kollam Ajith will join actors Baburaj and Baiju Johnson, who have also directed films of their own recently.